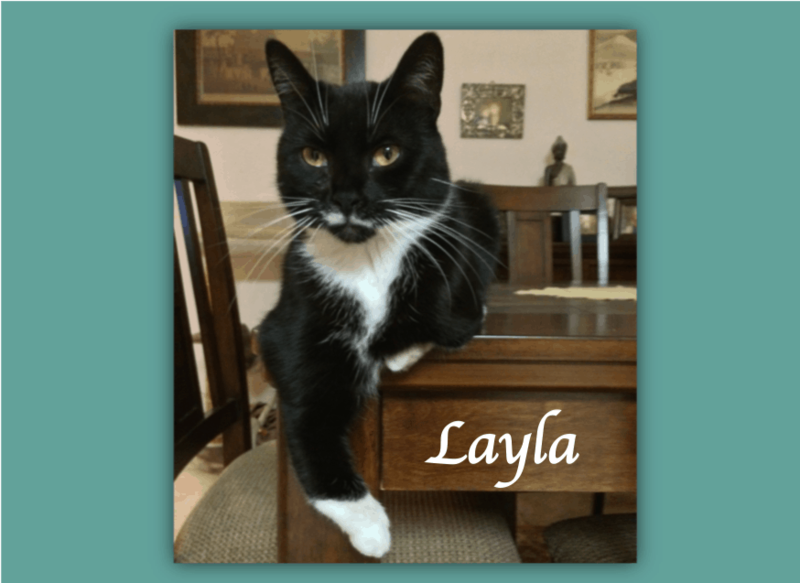 “I would like to share with you today the story of my Layla: a cat who lived, loved and died with us and along the way taught me more than I can ever say about love, dignity, acceptance and perseverance. Layla was a stray mother cat, found on the streets and taken with her 6 kittens to Kings County Animal Shelter. 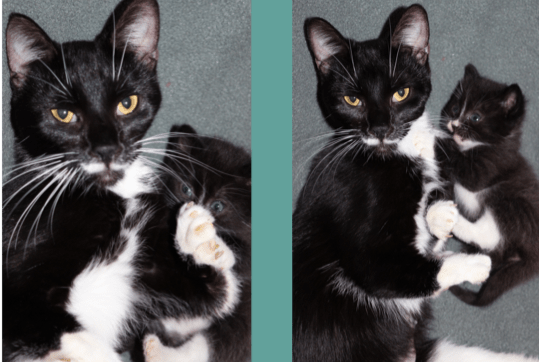 The day we heard of their plight there were only two kittens left alive, both black and white like their mother. Layla was born deformed and consequently stood on her hind legs like a meerkat. She had one very short front leg — it was basically half a leg with paw attached, and her other front leg was tiny and twisted around like a chicken wing. When babes George and Pattie were all grown up our daughter Kirstie adopted them, after which Layla mourned deeply. Time passed, filled with wonderful days and beautiful memories and then Layla developed lymphocytic, plasmacyctic stomatitis, commonly called stomatitis for ease! The renowned Dr. Jeff Levy became her homeopath and managed to keep her happy, well balanced and pain-free. But finally this nasty disease, which attacks the tissue in the mouth, worsened and soon Layla had all her teeth bar her canines removed. With Jeff’s incredible prescribing Layla bounced back and lived her life to the full……until recently when I realized her appetite was failing. We “knew” she would eventually require surgery again to remove her canine teeth and when she suddenly stopped eating, we ran a blood panel to be sure she was strong enough for surgery…. Oh boy were we in for a shock! The panel not only revealed her not strong enough for surgery, but her values indicated her to be end stage and about to die. I nursed her for the next two weeks wishing for a turnaround, but although Layla remained affectionate and responsive, willed herself to eat tiny amounts and remained by my side by day and night, it was not to be. Despite the many prayers by those who loved her, finally on March 7th at 730am our darling girl died, peacefully and very easily. I am well used to death and have learned to grieve with my animals before their passing but this time was different. After Layla left I felt as though I was wading through mud for days. I was tearful, irritable and just could not concentrate on anything. A dear friend helped me to realize that we go through various losses, survive and put them aside until a new, more intimate, personal grief unearths all the layers we’ve carefully covered over. Layla’s passing clearly evoked a passing of my own — perhaps from one way of life to another after the sale of the sanctuary. BrightHaven remains a shining light for animals — just in a somewhat different, but equally critical — way. Layla lay in state as so many before her, draped in a Buddhist prayer shawl, watched over by the dragonfly for transformation and light and surrounded with rose quartz and other crystals. Of course, she also had the BrightHaven teddy bear brigade to watch over her, the magical power of the unicorn and other mementos of her life, including photographs of George and Pattie. Her flowers were a beautiful mix of pinks and reds to match her equally vibrant self. Layla now treads the path to the afterlife where I know she’s being greeted by the many who have passed before her. We also have it on reliable authority that she now has her full legs back again and is prancing happily with the kittens who went before her. Please join me in sending love, Reiki and prayers for Layla’s journey onwards. Fare-thee-well sweet one. Our hearts go with you! I know it’s hard to let me go, and you fear not to see me anymore. You took me in when others said no. Thank you. A wild one deep down — you knew it wasn’t going to be an easy road. Yet you opened your heart and your doors. It didn’t take long for me to know you’d be my forever home. You knew my fears and what kept my heart closed. Your tender love and care soon made me bloom as I started trusting and opening my heart to love again. You showed me patience and respect by giving me space, allowing me to move at my own pace. Allowing me to be the wild child I have always been. You tamed my fears with your loving care. Just like a butterfly, today I must leave my chrysalis behind. My new life has given me wings and now I need to fly. Please don’t be sad. You truly did your job. You kept me safe until my transformation was done.